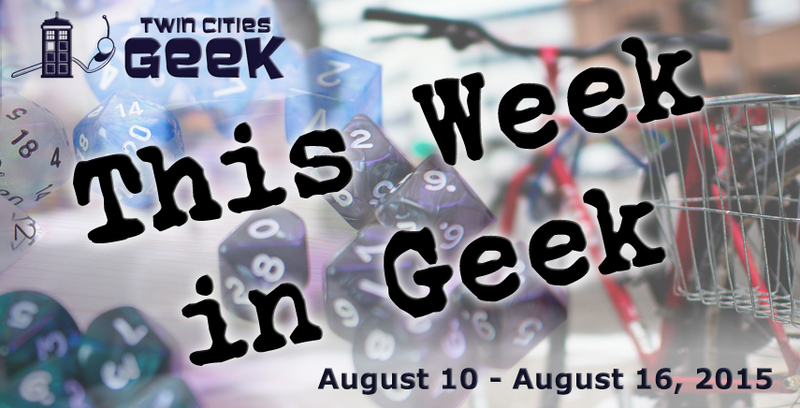 Welcome to This Week in Geek, your guide to events of interest to the Minnesota geek community for the week of Monday, August 10th through Sunday, August 16th. When: Monday, August 10th at 7:00 p.m.
“Bring your friends and a picnic blanket and claim a spot on the grass” for a performance by Tom Petty cover band All Tomorrow’s Petty (7:00 p.m.) and a screening of 1966’s Batman: The Movie (dusk, around 8:45 p.m.) in lovely Loring Park. In case of rain, head indoors to the Walker Cinema instead. When: Tuesday, August 11th at 7:30 p.m. When: Wednesday, August 12th at 6:30 p.m. When: Wednesday, August 12th at 7:00 p.m. If you aren’t one of the 16,000-plus people who have indicated on Facebook that they will be attending the Internet Cat Video Festival (above), TC Trek Trivia, the only pub trivia in the Twin Cities dedicated solely to Star Trek, is another event option this Wednesday evening. Hosted by “Master Trekkie” (featured in our article Meet Minnesota Cosplayers), TC Trek Trivia consists of five rounds: General Trek (questions covering all things Star Trek); Identify the Image; Ships, Technology, and Cultures; Complete the Quote; and a “Wild Card” round. Questions for each of these five rounds are drawn from all seven Star Trek television series and all twelve films. According to Master Trekkie himself, TC Trek Trivia is “all ages, no cover, food, drinks and a whole lot of Trek!” and is frequently followed by live music, provided this month by Demitri Rallis and From Frogleg. A costume contest, prizes, and refreshments will also be provided to attendees in honor of the second anniversary of TC Trek Trivia. Note that this is one of two Trek-themed events next week—you can also check out the Star Trek Bar Crawl on Saturday! When: Thursday, August 13th at 5:00 p.m. When: Thursday, August 13th at 7:00 p.m. When: Friday, August 14th at 8:30 p.m. In addition to Anime Detour (the annual convention for fans of Japanese animation, manga, video games, and culture), Anime Twin Cities is also working to provide monthly events for fans of anime and manga in the Twin Cities. One such event is the Tsuinshi Anime Club, for which they have joined forces with the Geek Partnership Society “to bring a little bit of fun to you on the second and fourth Friday of each month with this cosponsored anime club” at which they will be showing various anime movies and series. When: Saturday, August 15th at 4:00 p.m.
Northeast Minneapolis is once again the final frontier for the voyages of the Star Trek Bar Crawl, another geeky event in its fourth year, and a second opportunity for Star Trek fans to go on an “away mission” this week. According to Dani and Donavon Indovino Cawley, creators of the bar crawl, its continuing mission is “to explore strange, new bars . . .to seek out new friends and new things to do . . . to boldly drink where we’ve actually already drunk the last few years before!” The bars that the crawl will be beaming down to this weekend include the 1029 Bar (at 4:00 p.m.), Dusty’s Bar (5:00 p.m.), the 331 Club (6:00 p.m.), Mayslack’s (7:00 p.m.), the Knight Cap (8:00 p.m.), and Dangerous Man Brewing Company (9:00 p.m.). When: Saturday, August 15th at 6:00 p.m.